On July 1, TransAsia Airways, a Taiwan-based medium-sized international carrier, launched regular charter flights between Naha and Taipei. The flight runs once a day, and this is the first time that the company has operated such flights from Taipei to Naha. On June 20, at the Okinawa Prefectural Office, a sales representative of the company (second from the left in the photograph) held a press conference, saying, “Taiwanese tourists represent the largest number of foreign tourists coming to Okinawa. I am responsible for promoting exchange between Taiwan and Okinawa, and marketing the appeal of both regions.” The company aims to have flights running to at least 80% capacity in the first fiscal year. Aiming to commence regular flights from September, the company intends to apply in July to the Ministry of Land, Infrastructure, Transport and Tourism for an operating license. 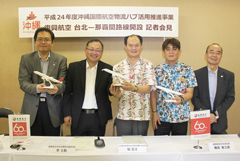 Considering that New Ishigaki Airport will be opened in March 2013 and the construction of the Naha Airport international terminal will be completed in January 2014, the company hopes to start flights between Ishigaki and Taipei, and between Naha and Kaohsiung. One flight is scheduled to take off from Naha at 10:30am and arrive at Taipei at 11:00am, and another is scheduled to take off from Taipei at 7:15am and arrive at Naha at 9:30am. The total number of seats on the plane is 182.